Provides an essential, comprehensive foundation for optimal health in a delicious chewable form. Delivers highly absorbable patented amino acid chelates and optimally balanced B vitamins. Contains vitamin A as beta-carotene and mixed carotenoids for the normal function of the immune system. 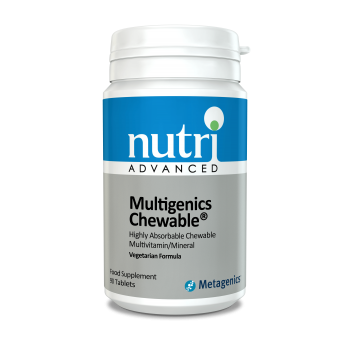 Multigenics Chewable® provides an essential, comprehensive foundation of nutrients for optimal health in a delicious chewable form. The formula delivers highly absorbable amino acid chelate forms of the minerals, present in citrate, bisglycinate and picolinate forms. The broad spectrum of nutrients within Multigenics Chewable® may provide protection from free radical damage and oxidative stress. These include vitamins C and E, zinc; and the trace minerals manganese and copper. This vegetarian formula is easy dosing at 1 tablet a day for 2-4 year olds, 1-2 tablets a day for 4-7 year olds and 3 tablets a day for older children and adults. Children 2-4 years: 1 tablet daily. Children 4-7 years: 1-2 tablets daily. Older children & adults: 3 tablets daily. This product contains vitamin A. Do not exceed 750µg of vitamin A (as retinol) per day if pregnant or likely to become pregnant except on the advice of a doctor or antenatal clinic. If taking any kind of medication or have a medical condition, consult a healthcare practitioner before using this product.